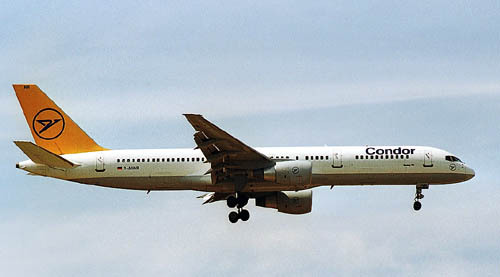 Boeing 757-230 D-ABNI (cn25437/422), seen here on final approach into Brussels IAP during May 2001, shows that the lower part of the fuselage is not yet painted in the well-known yellow colours of Condor. I would welcome comments on when these colours were introduced and when the lower part of the fuselage were painted in yellow. The old and the new ! Boeing 767-330(ER) D-ABUH (cn 26986/553) is seen here getting a pushback from the gate, behind a 757 in the new Thomas Cook livery; aft on the fuselage one can read "powered by Condor". 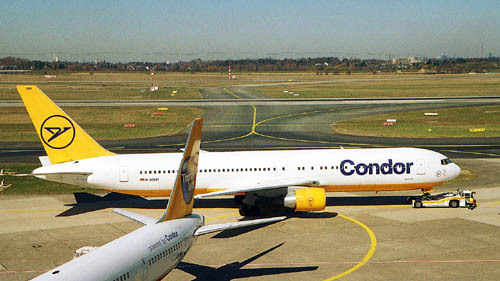 Date: March 23rd, 2003 at Dusseldorf. Boeing 757-230 D-ABNL (cn 25439/437) has just landed on Dusseldorf's runway 23L and is taxiing to the gate. The new colourscheme looks is shown to its advantage. Dusseldorf offers excellent photography from the visitor's terrace, until aproximately 2 pm when the sun is getting behind the aircraft. 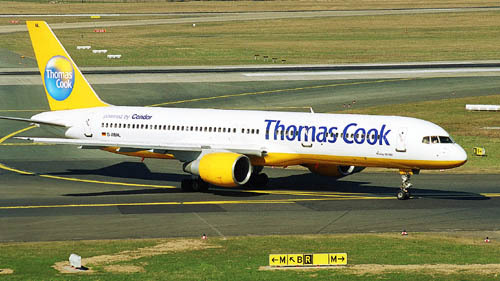 The Thomas Cook identity did not last long, it could not replace the familiar brand 'Condor' so quite soon the namechange was reversed.